Mean Girls terrorize a small liberal arts college. But did they commit murder? Author Kate White delves into the world of collegiate secret societies in her latest murder mystery. Kate White introduces us to celebrity biographer Phoebe Hall as she's crossing the Lyle College campus on a chilly Autumn evening. The college community is gathered to learn the fate of missing co-ed Lily Mack. Phoebe has more than a passing interest. Weeks earlier Lily had approached her asking if it was possible for someone to change to move beyond a bad situation. Phoebe tired and late for class had brushed her off. Now a sense of guilt and responsibility begins to grow in Phoebe's conscious. Not only for Lily, but for college president Glenda Johns, who offered Phoebe her teaching position. Phoebe's swank Manhattan lifestyle had taken two big hits and Lyle College had become her sanctuay. First her long-term boyfriend dumped her. And then within days, she was accused of plagarizing portions of her new book. Sadly the accusations had merit because she had not kept a close eye on her resarcher. So when Lily Mack asked her if one could move beyond a difficult situation, Phoebe truly could understand the emotion. But as we learn as we enter the plot fully, there was much in Phoebe's past that she hasn't dealt with. Glenda asks her to investigate a secret society rumored to be present on the Lyle Campus. You can feel the emotions driving the plot in this psychological thriller - guilt, loyalty and fear. White skillfully ratchets up the creep factor. It begins almost imperceptible shadows and increases to downright scary. We watch as Phoebe begins to form a new relationship with a fellow professor Duncan Shaw. Then we wonder just who is Duncan Shaw and is he to be trusted. Yes, there is a secret society on campus known as the Sixes. But are they just mean girls or are they murderers? As we meet each and every character, White shows us the shadow person. We are brought into a world where it is impossible to trust. White skillfully isolates Phoebe emotionally as she delves into the scary world of mean girls and secret societies. Kate White is the Editor-in-Chief of Cosmopolitan magazine and she is also a non-fiction author who writes books on female empowerment. With these credentials, she creates a truly believe character in Phoebe Hall as she investigates the Sixes. The vibe of this book rings so true. I live in rural New England in a 200-year-old house and I read this book on a warm October night. I could hear the leaves rustling outside and the floorboards creaking. I was so glad when my husbund arrived home! Kate White is a master at her craft. Her editing background is evident throughout this novel. The plot in this mystery is the very best that I've read in several years. If you read Sixes carefully, you will be able to take a realistic guess at who killed Lily Mack and why. You'll begin to understand the power behind the Sixes. But the plot never becomes boring or obvious - and it never stops being scary. 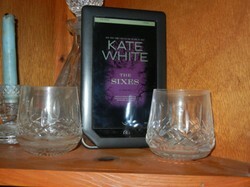 I admit that I've been a little sad that White hasn't written a Bailey Weggins mystery. They are smart mysteries with a dash of humor. Read Sixes carefully and you'll learn that Phoebe Hall is a fan of Bailey Weggins!